Now that harvest is in the rear view mirror (for most of you! ), it’s time to look ahead. As we’ve mentioned numerous times, we like to talk about actionable ideas that you can implement in your operation. Here’s a list of eight things that you can do to strengthen your operation for 2017 and beyond. Most grain merchandisers I know are a wealth of local market knowledge. Most are willing and enjoy sharing this information with their farmer suppliers. Here are a few things to ask them about. Inquire about local basis patterns. Basis follows certain local patterns and grain merchandisers can identify certain times of the year for you to target your basis “sales”. Ask them how they manage their spreads. This is an intermediate/advanced topic that many producers should learn more about. Futures spreads play a large role in the P&L of a commercial grain facility. You owe to yourself to learn about them. In our course, we talk about one big spread-related landmine that you need to avoid (hint: inverted markets). Ask what you’d need to do to be the producer they call when they really need bushels. You want to be the person they call when they are filling a train, a short sale, etc. Ask them what it would take to be that producer for them. Also, you should be careful when speaking to anyone who thinks they have the futures market “figured out”. Sometimes people who are involved with the markets on a daily basis can gain a dangerous confidence regarding market timing. With that said, most merchandisers have a great sense of market emotions, a solid understanding of cost of production, and respect the unpredicatable nature of grain markets. Schedule a meeting with your local merchandisers this winter. Most successful producers I know conduct split tests throughout the growing season. It’s your job to sit down with anyone involved in your agronomy decisions (including sales people) to evaluate and learn from your tests. As you likely know, every growing season is different. You don’t want to completely change your plan from year-to-year based on results that were based solely on a year-specific weather issue. You should try to identify trends in your tests from year-to-year rather than making a rash decision (eg. to completely throw out a company’s seed). As we like to say at Harvest Profit, “If you don’t measure it, you can’t improve it.” You’ve measured it, now learn from it and improve it! Also, I’d be completely open and share your results with neighbors and peers. Knowledge is going to spread regardless so why not learn as much as possible as soon as you can. No explanation needed! That includes stuff from us. If you don’t think we’ll add value to your farm, certainly don’t buy our course or software. Resistant weeds are costing producers a lot of money these days. They need to be dealt with but it’s my opinion that some producers are scared into buying an A+ mode of action (A+ = expensive!) when a B-quality mode of action (or generic) will work just fine. My recommendation is to solicit a bunch of advice this winter on what chemical plans are working best in your area with a focus on both effectiveness and cost-efficiency. In a business with as much uncertainty as in farming, it is difficult to make confident decisions. During good times, it’s easy to think that they are here to stay and vice versa (today!). There’s a lot of talk about the need for creating a grain marketing plan (another topic covered in our course) but I think it’s just as important to set long-term goals. For example, I met an older farmer who said that it was his goal to retire when he could sell all of his grain inventory/equipment and end up w/ $1 million after taxes and paying the bank. Guess who had an equipment auction after the 2013 growing season?! These goals can include anything but they should follow the S.M.A.R.T guidelines below. Becoming a better grain marketer is a good goal in theory but it’s not a SMART goal as it’s very hard to measure and it’s not time-based. Having more working capital is another good goal in theory but it’s not a SMART goal as it’s not specific or time-based. Me wanting to become a Minnesota Viking offensive lineman (because they’re absolutely terrible) is not a good SMART goal as it isn’t measurable, attainable (hey now! ), relevant, or time-based! Write down your goals and track them! Our favorite old friend, a spreadsheet, is great for simple goal tracking. Most landlords love to hear from their tenants. They also want to hear how the growing season went on their farm this year. I’d send two personalized letters to your landlords every year. One in the summer and one in the winter. You should be using these letters as an opportunity to solidify your business relationship while building and strengthening a personal relationship. I would use the software tool Trello to track farm details throughout the growing season so that you can easily find and share them with your landlords in your letters to them (once again, we discuss farm business productivity tools like Trello in our course). Landlords typically don’t give you a lot of advanced notice when they are looking for a new tenant. If they do, they likely already “have one foot out the door.” Spend a few hours a couple times per year building a relationship with them. The key here is to be consistent with your communication. If you promise regular newsletters but fail to deliver, you’re doing more harm than good. If you start, keep it up! This is very relevant to setting SMART goals. You owe it to your operation to have an easy-to-use balance sheet in place so you can track your goals and evaluate finance/risk management decisions. 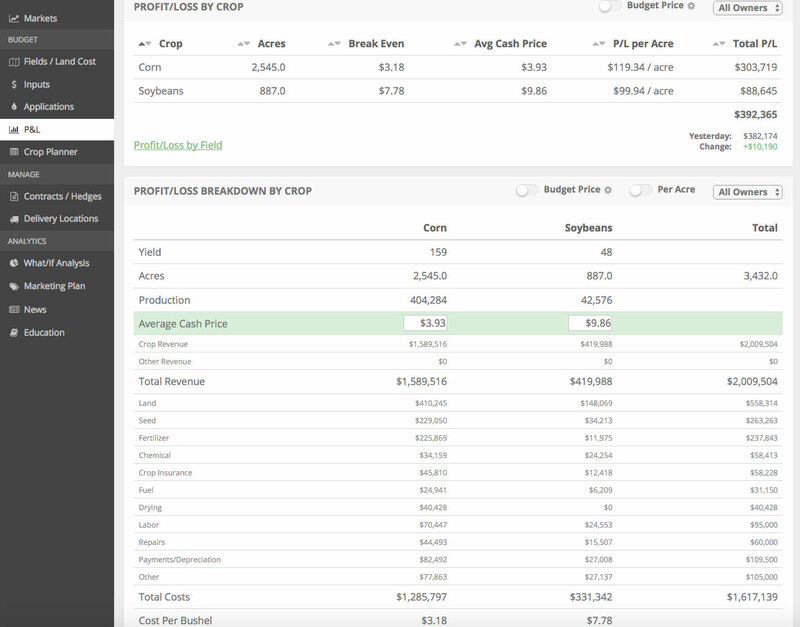 At the end of the day, your farm’s balance sheet is a no-BS view of your farm’s finances. You should know it backwards and forwards. Don’t rely on the bank to do this for you. You should be in a position to bring a completed balance sheet to your bank with “ownership” (understanding) of every line item. This winter, bring your balance sheet to the bank and ask them if there’s anything you can do to reduce your payment obligations in 2017 (refinance, term adjustment, etc). It never hurts to ask! Most of you are likely already doing this but it’s important. So keep it up! Before #1, sign up for our free e-mail newsletter below if you haven’t already. I’ve thoroughly reviewed the financials of farms raising crops on 1+ million acres. The #1 trait I’ve seen in the most financially successful operations is the ability to make unemotional, numbers-based farm business and risk management decisions. It’s true that grain markets don’t care about one producer’s cost of production or balance sheet, but…. …..it’s our opinion that farming is more profitable and productive (and fun!) for proactive, numbers-focused operations. Here are a few actionable ways you can implement a more numbers-based approach in your farming operation this winter. You need to be able to generate your own balance sheets. Too many producers rely on their banker to build their annual balance sheets. You need to “own” this financial statement. Find a system that works for you such as Excel, Google Sheets, Finpack, Quickbooks, PC Mars, etc. Set 5, 10, & 20-year working capital/net worth targets and plot them on a graph a few times/year. The act of simply tracking your financial metrics does a surprisingly good job of keeping you “on point”. You need a “living and breathing” cash flow statement that focuses on your current profit margin. It’s very easy to get caught up in prior “under-the-market” sales and hedges during a rallying market (eg. the summers of 2014 & 2015). These can paralyze a person into not capturing profitable opportunities. Our software makes it easy to put this system in place. Click the button below for access to a live demo account. As an example of #3, a farmer we know of ours was heavily forward sold coming into this harvest (not all at the highs of course, but a solid average price) and simply hedged his remaining bushels post-harvest after calculating a profit of $150+/acre. Skip to the next paragraph if you’re not a numbers junkie like me. This is probably more information that you care to know but I can’t help myself but get into the details….his profit is “actually” closer to $120/acre. He’s a cheap guy who hasn’t upgraded equipment in 3-4 years and his day of reckoning (replacement) is coming. His cash flow is going to get whacked with a sizable equipment replacement expense this winter but as you’ll see below it won’t be an issue for him. He called me recently and asked me about “re-owning” 50% of his 2016 corn. I told him that I’d simply move on to 2017 and put a profitable year in the rearview mirror. Fast forward to a couple days later…..he calls me when corn is up $.11/bushel and he’s surely frustrated that he didn’t re-own his corn…right?? Nope! He was pumped that the the market was higher and excited to start looking at 2017 opportunities. This producer is 10+ years from retirement with 100%+ working capital and zero debt. I’d argue he’s actually too conservative…… but that’s a story for another day. I’m highly confident that his numbers-based, profit-focused approach has netted him $1+ million over the last 20 years vs. simply riding the market cycles. Heading into 2017, you should work on improving or strengthening your farm business/risk management knowledge, tools, and processes. It’ll pay large dividends over time! We’d love to help you strengthen your farm for the years to come. We take great pleasure in working with farmers across the US and Canada and we remain focused on helping our users thrive. If you succeed, we’ll succeed! Disclaimer: All examples given are strictly hypothetical and neither the information, nor any opinion expressed, constitutes a solicitation to market commodities, to buy or sell futures, or options on futures. Past performance and results are not indicative of, nor do they guarantee, future performance. Commodity marketing has inherent risks. Trading and/or marketing decisions, as well as any gains or losses thereof, are the sole responsibility of the commodity owner, producer, and/or account holder. Market Wise Ag. Services, LLC, it’s principals and employees, Harvest Profit, Inc. and Midwest Hedging, LLC assume no liability for any use of any information contained herein.